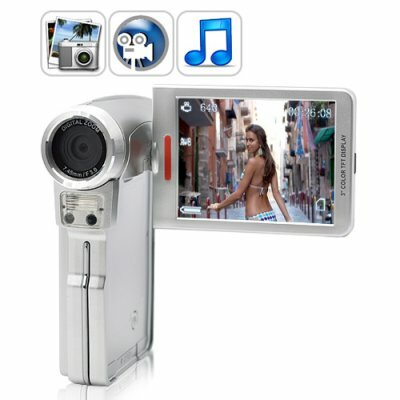 Successfully Added Digital Video Camera (Ultra Compact DV Camcorder) to your Shopping Cart. Digital Video Camera – Ultra Compact DV Camcorder. New budget DV camera that is compact in size but big sized in features. This handheld Digital Video Camera can easily fit in your pocket while packing a lot of performance in its compact frame. This digital camcorder has a great range of video and still capture features; from easy to use view flip out screen and convenient recording buttons to the easy memory expandability with SD cards and easy in-field changing of batteries. It's not until you capture video and photos from the camera and put them on your TV or computer that you will see this unit's most impressive feature - the vibrant, clear imagery that is captured with this budget priced little wonder. Its simply amazing what good quality you can get from digital photography products these days, and this model is no exception. This is another example how far along digital products have come these last few years in both reducing cost and improving performance. A low wholesale price makes this digital camcorder the must have item for anyone interested in making videos for weekend and family adventures. The DV02 is in stock for immediate shipment. Order it today and we will ship it out tomorrow - guaranteed! Packages includes everything you need. Take it out of the box and start filming! Great as a gift to give to newlyweds, college students, relatives at Christmas, or "citizen journalists"
How does this digital video camera compare to Samsung and Sanyo model camcorders? The DV02 is thinner, has more features, and comes with a kit including everything you need to start filming videos right away. It also comes at a low China wholesale price! The photos I save to my memory card are just fine, but I have some trouble with the videos I save, what is the problem? Either the SD card is low speed or has the wrong content inside. The way to solve this is to format the SD card through the camera instead of your PC. Do you have any tips for making my indoor pictures clear, because I used to have a Sony DV Camera and all the videos I took with it looked blurry and dark? Try setting the ISO to Auto or Manually set the ISO high, and use the normal and digital light settings for more brightness when shooting indoors. It also should be noted that you should keep the camera (and the target subject) steady for several seconds when taking pictures. Nice. Does everything i expected it to do. By the way, this cam has a unexplained webcam function(you need to install the software off the included cd first). Also, when you plug it in, if you're using windows xp, the scanner & camera wizard pops up for a nice way to download your photos(no videos/voice notes), better than just dragging your pics/vids to your pc. All of the stated features work very well. Excellent quality pictures and videos. I find the battery weak at times but I don't charge it enough at times. Great return for your purchase price. Ultra compact camcorder is very god and has big screen. Great camera for the price of nice photos.